September 12, 2014	by Jakub Gieryluk | Debugging, Tools	| Comments: no responses. Proper tooling is essential for development process. We’re pleased to opensource Fiddler rules file for Aria Templates users to facilitate debugging of AT applications. 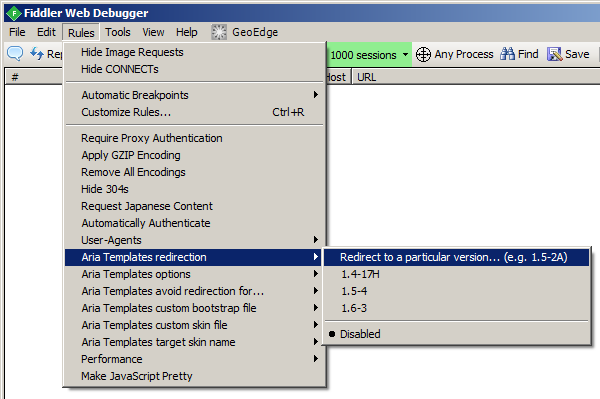 Fiddler is an extendable web debugging proxy. It can be used for a whole array of usage scenarios involving inspecting and redirecting web traffic. The redirections use Aria Templates CDN for fetching appropriate files, so you don’t have to deploy anything anywhere. Just select some options from a handy menu and you’re ready to go. If you’re interested (you should be! ), head to the dedicated GitHub repo to read more!